Our classroom research project was to write an informational book about Animals, using Google Docs. Our goal is to create a meaningful book that uses all of the informational text features that we are learning about. Have you ever played that trivia game at Buffalo Wild Wings? The one where you get points for buzzing in with the correct answer quickly? This is the academic version. Teachers can create their own quizzes, play the game, and then download the color-coded test results. In a 1:1 environment, this would make testing a snap- a fun, raucous, loud snap. (Perhaps its not the best test because it encourages a bit of laughter and shouting, but still. This is fantastic.) In my classroom with one iPad, we beg borrow and steal other teachers' iPads for an hour to do it. Even better? Yes. My students took my quiz and then created their own quiz to stump their classmates based upon our current reading series. We are learning about habitats. If you think you are smarter than a first grader, try your luck at this quiz. As a part of our district's new literary curriculum, we use inquiry to answer questions of our informational texts. We research and answer these questions through projects and presentations. This week, students as a whole group created a word cloud to answer the question "What do communities need?" The words are weighted by student opinion about what is most important to them in their community. 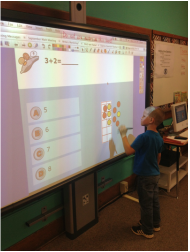 Linking into the whiteboard to the left, these student response clickers allow students to digitally respond to questions I pose in class. Because of this system, I can instantly see how well students understand a new concept – in real time. This information enables me to move on to more challenging material (or remediate) within a lesson without waiting to correct papers or administer a test. When students raise their hands to answer I might know how well a few students comprehend the lesson. With this system, every student has a chance to quietly respond. Further, the system logs precisely who understood the concept and who did not. 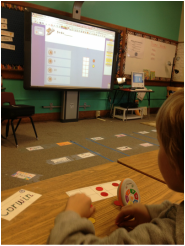 I am able to take small groups of strugglers and immediately re-teach during center time. Likewise, I can challenge those who are mastering the concepts quickly. This response system is a game changer. I am very grateful. While this is more parent-impact, it has had a great effect on my students. This service allows me to send group text messages out to parents, while not using my own phone. Parents sign up for Remind101 and I schedule reminders for them, like you see on the right. I even can forget about the reminder until it comes to me also! Writer's Workshop -- Being in two places at once!! In the video, you are looking at my front whiteboard. I'm walking around the room with my iPad and interviewing students about their work. Obviously, my goal was to review the writer's workshop process. I'm using an iPad app called Explain Everything that allows me do all sorts of things while teaching. My computer/projector is running a program called Reflector that allows everything on my iPad to show up on the front screen. I can write on the front board from the back of the room. It is as close to being in two places at once as I have ever been. Class Dojo has been a fun classroom management tool. My students have overwhelmingly "bought-into" this program. Students earn positive and negative "dojo points" based on their behavior. They have goals and I incentivize the points through our prize box. Parents and students are able to log in to www.classdojo.com at home and see individual behavior reports. Student info is kept confidential through parent access codes. Student can even get their own "secret code" and customize their avatar. I have an app on my iPad and iPhone that allows me to grant points no matter where we are, from the classroom, to the hallways, to the zoo. Note to Parents: I typically start this management tool in second quarter. You will get info in your child's backpack after we begin! Sally, our school secretary, retired. My 2012-2013 class made this video for her. Nate said it best, " . . . then I'm gonna hafta miss her." My "Math Reporters" are excellent mathematicians! They love creating projects. Now that a few kids have made videos, everyone wants to! These girls worked very hard to put this video together. They had to decide on a subject, collect their data, organize it, and then create a storyboard with dialogue. Only then were they given a camera!